For over two decades, Frontier Dental Care has served Concord with state of the art dental care for treating damaged and missing teeth. 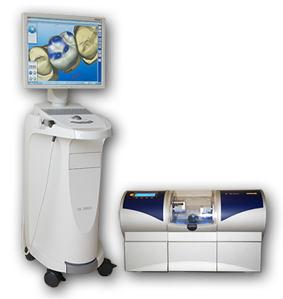 With CEREC® technology, our dentists can offer same-day crowns, inlays, and onlays. This provides our patients with the convenience of reduced visits, and improves patient experience by delivering restored smiles more efficiently. Traditionally, the tooth restoration process can take several weeks. With CEREC®, we have the ability to mill your restoration in house, and our patients can receive a customized restoration within a single visit. This innovative dental technology allows Dr. Ramos to take digital impressions of your smile, capturing the unique contours of your teeth to create personalized restorations that specifically fit your needs. Inlays & Onlays: We create same-day inlays and onlays which are excellent protective and aesthetic treatment options. These are best used when there is enough healthy tooth structure that would make a crown unnecessary.Crowns: These rebuild dental function after root canal therapy or trauma. Crowns: Crowns last for many years with the proper care and look just like natural teeth. We carefully match your restoration to a similar shade as your surrounding teeth, ensuring a natural look and feel. They are also the final step after dental implants have been placed for the replacement of missing teeth. Dental implants and same day restorations are offered at our dental office. If implants are necessary to maintain a healthy jawbone after tooth loss, we surgically place a small titanium post that acts as the tooth’s root and then after your jawbone has fused with the post, we can attach the crown, bridge, or denture. Implant supported prosthetics are the gold standard for tooth replacement, and is a simple and safe procedure. For more information about dental implants please see our dedicated page. It is our passion to provide effective and comfortable dental care for the families and patients in Concord and the surrounding areas. Same-day dental restorations leave patients with a functional, more beautiful smile in less time. Contact us today to meet with Dr. Ramos to plan your restorative treatment.